Continuing with my KonMari process, I tackled the “clothes on hangers” sub-category. For me, they were the old business outfits and dresses that I’ve stored away in another closet that I couldn’t possibily fit into my own. Other then the volume of clothes, this was very easy. 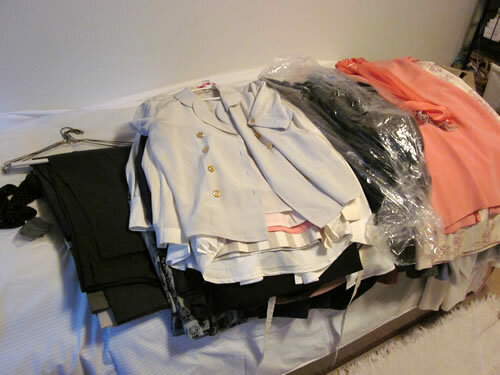 They were too small but still in very good condition so all of them went to my favorit 100% volunteered local charity. 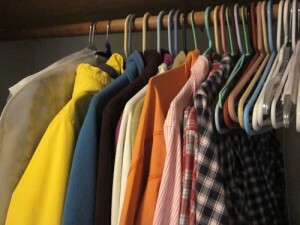 And of course, there were many other ways to give your old clothes second lives. In my previous post, I mentioned how I thank my out-going clothing by folding or arranging them nicely before I delivered them to charity shops. A lady at the shop mentioned how nice it was to received them this way. Not only my old clothes got more appreciation, it brought the volunteers joy while they work. I wished I’d donated these quality garments much sooner. I found some spongy padding on hangers turned to sticky dusts because they are so old, I worried that the charity shop might not get as much money out of them. Do keep the dry cleaning bags for until you are done with the entire cleanup. Use them as light garbage bags (tide the hanger opening). Or in our area, home shredded paper are required to go into a clear plastic bag, so I saved it for the document clean up phase. After the clean up, there are only three things left on hangers that I don’t wear often. I love that I can actually see the backwall of my closet now. This entry was posted in Deepening Green, I Learned This, Tips for Daily Life and tagged clothes, KonMari method, Marie Kondo, recycle, reuse, textile by n2n. Bookmark the permalink.